COCONUT OIL - STEP TOWARDS HEALTH! 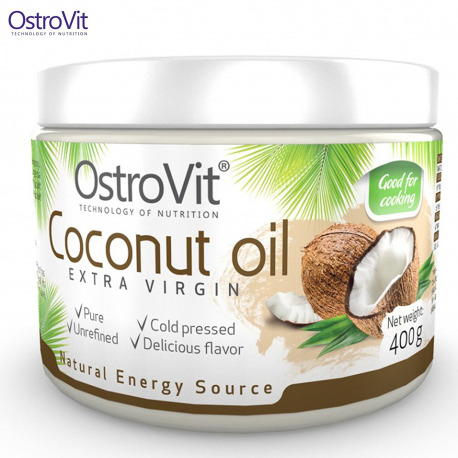 High-quality coconut oil of natural origin. It does not contain unnecessary additives and fillers! It will be the perfect choice for use during cooking. Clean, coconut flavor and cannons combine well with different flavors - will surely appeal to you! Coconut oil is a unique fat rich in valuable health properties for our body. In a nutshell largest - oil, coconut oil strengthens the immune system - has strong antibacterial properties and protects our body against viruses. It has beneficial effects on metabolism and work of our metabolism. Therefore, in spite of its caloric value as oil - ideal for people who want to lose weight and at the same time take care of their health. It is a product prepared for those who avoid or limit their intake of sugar and salt in their diet. How can you use coconut oil in the kitchen? This oil has a slight coconut taste. It is solid at room temperature and melts at 26°C. Coconut oil is a preferred cooking oil as it contains short and medium chain fatty acids. It is quick-melting, resistant to oxidative rancidity, has a pleasing flavor and is easily digestible. Because of its high content of lauric acid, coconut oil has gained importance as a dietary fat. In the body, Lauric Acid converts into monolaurin, a compound which is good at fighting viral pathogens, and is also present in large quantities in breast milk, where it is believed to help protect infants from viral, bacterial and parasitic infections. Even though coconut oil is a fat, it actually promotes weight loss. The reason is because of the healthy medium chain fatty acids. These fatty acids do not circulate in the bloodstream like other fats, but are sent directly to the liver where they are immediately converted into energy, just like carbohydrates, but do not have the negative impact for low carb dieters on blood sugar that carbohydrates have. So the body uses the fat in coconut oil to produce energy, rather than be stored as body fat. Natural Appearance: In its natural state, Coconut Oil has a highly variable composition due to its low solidification threshold of 26°C. At temperatures below 26°C the product will begin to solidify and clumps may appear; this is normal. Bubbles may also appear, and may resemble dark spots in the product; this is also normal. We does not use any additives or preservatives in our Coconut Oil. It is a 100% natural product. Recommended Use: Take 1 Tablespoon 1 to 2 times daily with meals or as required. This Coconut Oil can also be used in salad dressings, sauces, or any type of cooking as a source of essential fatty acids.